The Portland Metro Arts Music Program offers group classes and private lessons in Cello, Flute, French Horn, Guitar, Piano, Trumpet, Ukulele, Violin, Viola, and Voice. Our teachers offer lessons to beginners as well as advanced students, and go at a pace that responds to each student's individual needs. Learning proper technique for voice or an instrument gives a student a lifelong skill in an artform that enriches their life and builds confidence in their own abilities. Music is also one of the fundamental performing arts. Here at PMA students have several opportunities to perform throughout the year and showcase their talent and accomplishments in class. All music classes and lessons run from Sept. 4, 2018 - June 14, 2019 with summer sessions of private music lessons. Enrollments are accepted throughout the year. Please click on the links below or scroll down for registration information. Private lessons are subject to instructor availability, and it is often a good idea to call or email us to inquire about lesson times. Class tuition can be paid in a single; two or 10 equal payments made September through June. The amounts listed below reflect the equal payment option. CLICK HERE for full tuition payment options. All beginning group classes are open to age appropriate students with little or no previous music training. Learning in a group setting is a fun way to introduce playing an instrument, while getting “hands on” experience, making new friends & gaining musical skills! See your child's face beam in self-confidence with the success of making music from the very first lesson. Students will learn the basics of playing an instrument, while developing note-reading and overall musicianship. Violin, Viola, and Cello students will need to provide their own appropriately-sized instrument. Music is provided. Parent participation is strongly encouraged. Children and adults can experience the joy of playing a musical instrument. Beginning and intermediate students can arrange for private lessons in Cello, Flute, French Horn, Guitar, Piano, Trumpet, Ukulele, Viola, Violin, and Voice. 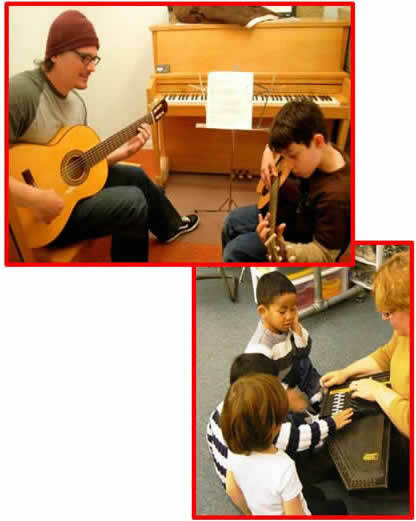 Our private music lessons are 30-minutes long and given once per week. Scheduling depends on teacher availability. We take new enrollments throughout the year, so it’s never too late to start! 45-minute and 60-minute advanced or semi-private lessons are available on request. The School Year class tuition can be paid in one, two or 10 equal payments, made monthly September through June. Tuition listed below reflects the 10-equal payment option. Once you've enrolled you can CLICK HERE to choose a day and time for your lesson.